A boost converter (step-up converter) is a DC-to-DC power converter that steps up voltage (while stepping down current) from its input (supply) to its output (load). It is a class of switched-mode power supply (SMPS) containing at least two semiconductors (a diode and a transistor) and at least one energy storage element, a capacitor, inductor, or the two in combination. 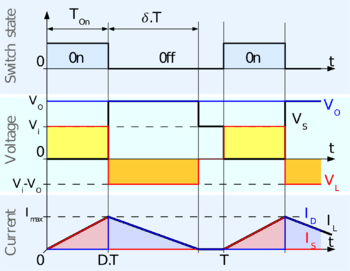 To reduce voltage ripple, filters made of capacitors (sometimes in combination with inductors) are normally added to such a converter's output (load-side filter) and input (supply-side filter). The basic schematic of a boost converter. The switch is typically a MOSFET, IGBT, or BJT. Power for the boost converter can come from any suitable DC sources, such as batteries, solar panels, rectifiers and DC generators. A process that changes one DC voltage to a different DC voltage is called DC to DC conversion. A boost converter is a DC to DC converter with an output voltage greater than the source voltage. A boost converter is sometimes called a step-up converter since it "steps up" the source voltage. Since power ( ) must be conserved, the output current is lower than the source current. For high efficiency, the SMPS switch must turn on and off quickly and have low losses. 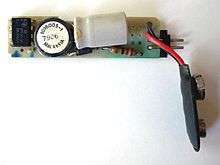 The advent of a commercial semiconductor switch in the 1950s represented a major milestone that made SMPSs such as the boost converter possible. The major DC to DC converters were developed in the early 1960s when semiconductor switches had become available. The aerospace industry’s need for small, lightweight, and efficient power converters led to the converter’s rapid development. Switched systems such as SMPS are a challenge to design since their models depend on whether a switch is opened or closed. R. D. Middlebrook from Caltech in 1977 published the models for DC to DC converters used today. Middlebrook averaged the circuit configurations for each switch state in a technique called state-space averaging. This simplification reduced two systems into one. The new model led to insightful design equations which helped the growth of SMPS. Boost converter from a TI calculator, generating 9 V from 2.4 V provided by two AA rechargeable cells. Battery power systems often stack cells in series to achieve higher voltage. However, sufficient stacking of cells is not possible in many high voltage applications due to lack of space. Boost converters can increase the voltage and reduce the number of cells. Two battery-powered applications that use boost converters are used in hybrid electric vehicles (HEV) and lighting systems. The NHW20 model Toyota Prius HEV uses a 500 V motor. Without a boost converter, the Prius would need nearly 417 cells to power the motor. However, a Prius actually uses only 168 cells and boosts the battery voltage from 202 V to 500 V. Boost converters also power devices at smaller scale applications, such as portable lighting systems. A white LED typically requires 3.3 V to emit light, and a boost converter can step up the voltage from a single 1.5 V alkaline cell to power the lamp. An unregulated boost converter is used as the voltage increase mechanism in the circuit known as the 'Joule thief'. This circuit topology is used with low power battery applications, and is aimed at the ability of a boost converter to 'steal' the remaining energy in a battery. This energy would otherwise be wasted since the low voltage of a nearly depleted battery makes it unusable for a normal load. This energy would otherwise remain untapped because many applications do not allow enough current to flow through a load when voltage decreases. This voltage decrease occurs as batteries become depleted, and is a characteristic of the ubiquitous alkaline battery. Since the equation for power is ( ), and R tends to be stable, power available to the load goes down significantly as voltage decreases. The key principle that drives the boost converter is the tendency of an inductor to resist changes in current by creating and destroying a magnetic field. In a boost converter, the output voltage is always higher than the input voltage. A schematic of a boost power stage is shown in Figure 1. (a) When the switch is closed, current flows through the inductor in clockwise direction and the inductor stores some energy by generating a magnetic field. Polarity of the left side of the inductor is positive. (b) When the switch is opened, current will be reduced as the impedance is higher. The magnetic field previously created will be destroyed to maintain the current towards the load. Thus the polarity will be reversed (means left side of inductor will be negative now). As a result, two sources will be in series causing a higher voltage to charge the capacitor through the diode D.
If the switch is cycled fast enough, the inductor will not discharge fully in between charging stages, and the load will always see a voltage greater than that of the input source alone when the switch is opened. Also while the switch is opened, the capacitor in parallel with the load is charged to this combined voltage. When the switch is then closed and the right hand side is shorted out from the left hand side, the capacitor is therefore able to provide the voltage and energy to the load. During this time, the blocking diode prevents the capacitor from discharging through the switch. The switch must of course be opened again fast enough to prevent the capacitor from discharging too much. Fig. 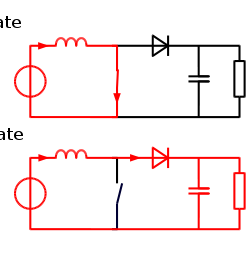 2: The two configurations of a boost converter, depending on the state of the switch S.
The input current is the same as the inductor current as can be seen in figure 2. So it is not discontinuous as in the buck converter and the requirements on the input filter are relaxed compared to a buck converter. Fig. 3: Waveforms of current and voltage in a boost converter operating in continuous mode. D is the duty cycle. It represents the fraction of the commutation period T during which the switch is On. Therefore, D ranges between 0 (S is never on) and 1 (S is always on). The above equation shows that the output voltage is always higher than the input voltage (as the duty cycle goes from 0 to 1), and that it increases with D, theoretically to infinity as D approaches 1. This is why this converter is sometimes referred to as a step-up converter. Fig. 4:Waveforms of current and voltage in a boost converter operating in discontinuous mode. Compared to the expression of the output voltage gain for continuous mode, this expression is much more complicated. Furthermore, in discontinuous operation, the output voltage gain not only depends on the duty cycle (D), but also on the inductor value (L), the input voltage (Vi), the commutation period (T) and the output current (Io). The hydraulic ram can be seen as analogous to a boost converter, using the electronic–hydraulic analogy. Mohan, Ned; Undeland, Tore M.; Robbins, William P. (2003). Power Electronics. Hoboken: John Wiley & Sons, Inc. ISBN 0-471-42908-2. Basso, Christophe (2008). Switch Mode Power Supplies: SPICE Simulations and Practical Designs. New-York: McGraw-Hill. ISBN 0-07-150858-9. Wikimedia Commons has media related to Boost converters.